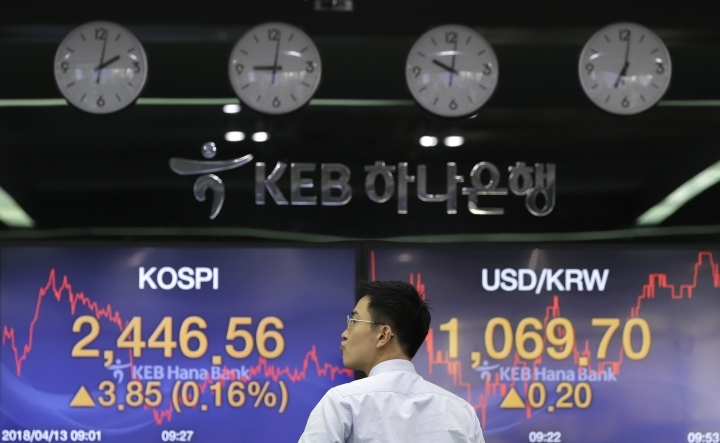 SEOUL, South Korea — Global stock markets were mostly higher Friday after the U.S. said it was exploring the possibility of returning to trade talks with 11 Pacific countries. Sentiment also improved as the U.S. said it is consulting allies before making a final decision on possible military strikes against Syria. KEEPING SCORE: France's CAC 40 rose 0.3 percent to 5,327 and Germany's DAX gained 0.6 percent to 12,490. Britain's FTSE 100 was down 0.1 percent at 7,252. Futures augured a tepid start on Wall Street with S&P and Dow futures both up 0.2 percent. ANALYST'S TAKE: "U.S.-centric politics once again played the key role in shifting the alternating market sentiment with President Donald Trump toning down on the attacks upon Syria," Jingyi Pan, a market strategist at IG in Singapore, said in a daily commentary. "Early movers in the Asian region have certainly caught on this improved sentiment, with the icing on the cake being President Donald Trump's directive to consider the re-joining of the Trans-Pacific Partnership." TRADE: Trade has been a big issue that swayed global stock markets since the onset of the trade dispute between the United States and China. Those concerns took a back seat as Trump asked advisers to explore the possibility of the U.S. returning to trade talks with 11 Pacific nations to rejoin the Trans-Pacific Partnership. SYRIA: Trump put off a final decision on possible military strikes against Syria after tweeting earlier that they could happen "very soon or not so soon at all." The White House said on Thursday the United States will continue to consult its partners and allies. The statement eased worries about escalation of tensions. Trump's earlier tweet suggested that he wanted to retaliate against Russia after the recent suspected chemical attack in Syria. ASIA'S DAY: Asian markets finished higher. Nikkei 225 rose 0.6 percent to 21,778.74. 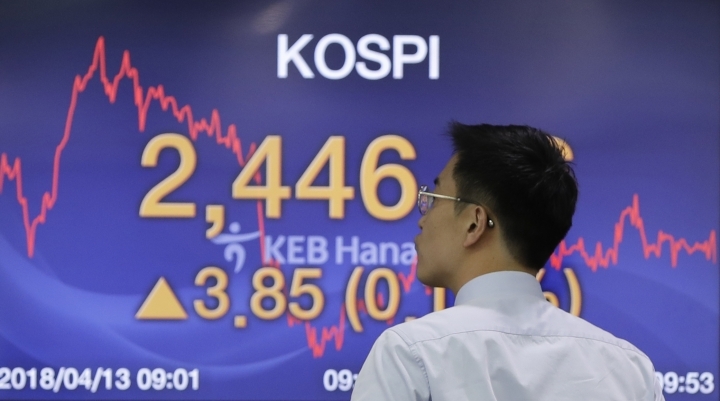 South Korea's Kospi advanced 0.5 percent to 2,455.07. 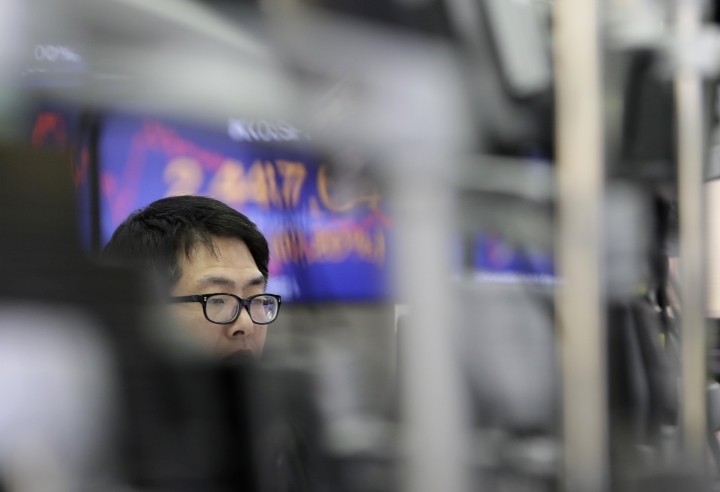 Hong Kong's Hang Seng index edged down 0.1 percent to finish at 30,808.38. China's Shanghai Composite Index lost 0.7 percent to 3,159.05. Australia's S&P/ASX200 rose 0.2 percent to 5,829.10. Stocks in Taiwan, Singapore were higher but in the Philippines and Indonesia they were lower. CHINA DATA: China's global trade balance swung to a rare deficit in March as exports dropped, but its surplus with the United States stood at $15.4 billion. Exports contracted 2.7 percent from a year earlier to $174.1 billion, down from the 24.4 percent growth for the first two months of 2018, customs data showed Friday. Imports rose 14.4 percent to $179.1 billion, though that was down from 21.7 percent growth in January and February. OIL: Benchmark U.S. crude rose 31 cents to $67.38 per barrel in electronic trading on the New York Mercantile Exchange. The contract rose 0.4 percent on Thursday. Brent crude, used to price international oils, gained 24 cents to $72.26 per barrel in London. It shed 0.1 percent the day before. CURRENCIES: The dollar rose to 107.63 yen from 107.32 yen. The euro strengthened to $1.2336 from $1.2328.